The folks who run the Walt L. Shamel Community Garden on Dean between Franklin and Bedford know how to throw a party, and tomorrow night, they're hosting neighborhood kids and adults alike at a Halloween bash from 4pm - 9pm. There'll be candy and activities for the young'uns, and a very well-decorated garden to admire if you're too old for trick-or-treating (along with food and drink, though I'm just basing that on past events, including last year's Halloween party). Check it out! I try to avoid being a smug, secular liberal when I blog, and I almost didn't post this photo of a storefront church at 98th Street between Livonia and Riverdale as a result, but curiosity got the better of me. Presumably, this storefront church was not named for PepsiCo's highly caffeinated lemon-lime drink, but if you google Mt. Dew (or even "Mt. Dew") the first few hundred entries are all soft-drink related, including a recipe for a Mountain Dew cake. I also learned, to my surprise, that Mtn Dew (the drink's official handle as of late 2008) is the 4th best-selling soft drink in the USA, behind Coke, Pepsi, and Diet Coke. "Mountain Dew" is also a euphemism for moonshine that has spawned two songs, but I'm willing to assume that this wasn't the inspiration for a church name either. 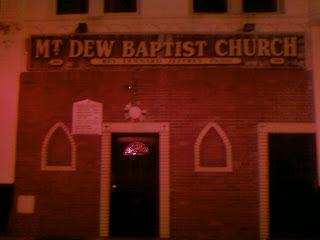 The only things that I could turn up with searches for "mount dew" were a church and cemetery in Caroline County, VA. It's perfectly possible that this Brooklyn church is an offshoot of the parent church in Virginia--many storefront churches in New York City are founded by young deacons or pastors with backing from a larger church "back home" to serve migrants--but since that's the only thing I have to go on, I'm not entirely convinced. If anyone has another explanation for the name, let me know. Sitting at the Franklin Park Reading Series the other night, a friend remarked that Franklin Park was one of the only establishments in the area that consistently pulls people in from all over Brooklyn, and occasionally even from that little island across the East River. 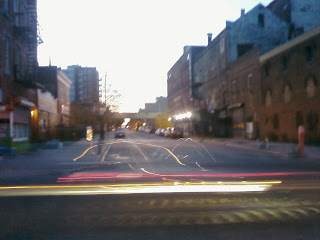 This led me to tell a story about running into a very drunk reveler one evening last fall while I walked up Franklin. She was shouting into her iPhone about being lost, and as the lady and I approached, she whirled around and asked with furious impatience "Where the hell is this beer garden?" We started to tell her to head back up the street, but she insisted "I know it's on St. Marks! They said St. 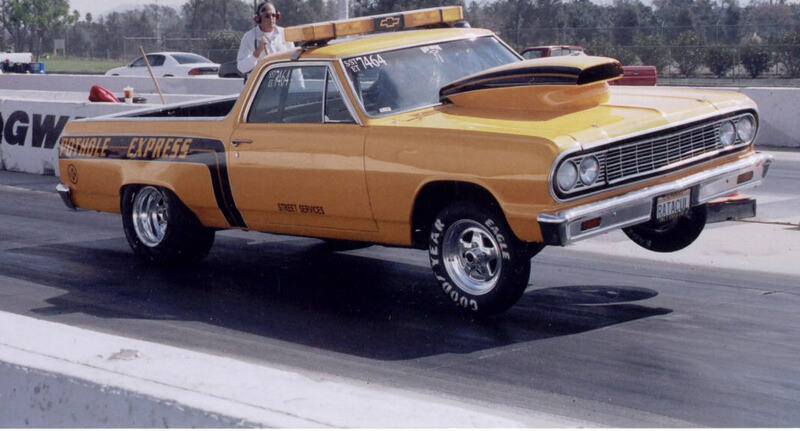 Marks!" She had clearly decided we were not going to be of use, and stormed off towards the abandoned section of the old Jewish Hospital before we could tell her that she had the wrong apostle. My companion offered this amusing argument: she really should have known it was St. Johns, not St. Marks, because (riffing on his earlier theme of FP being a draw for non-locals) the gospel of John is the one written for the gentiles. And that, my friends, is your deep thought for the night. Unrelated - In keeping with the church theme, I enjoyed this story about a ambitious pastor making creative use of a Greenpoint church over the weekend. Also, the Avenue continues to draw attention from local reporters--here's the latest report, which was linked by a poster here. I snapped these two photos as I rolled slowly down Prospect Place on my bike between Howard and Ralph in Ocean Hill the other day. Two very different takes on the traditional home of the urban yeomanry, the row house, executed at least 50 years apart (I'm guessing). The two developments stretch almost half the block, right across from one another. All things considered, I prefer the aesthetics of the older houses, but the new ones looked well-kept, well-loved, and lived in, which is all one can ask of a development like this. Despite some truly wretched weather, Tony Fisher threw a great party on Saturday night to open his new coffee shop at 805 Franklin. Flanked by family members and an able staff, Fisher dolled out free coffees, teas, and a wide assortment of baked goods to local folks and a few Brooklyn luminaries (Marty Markowitz stopped by to offer his congratulations and a Borough Proclamation). The awning and sign look great (Fisher's brother explained that they held a contest online for the design), and the snug space is cozy and warm inside the french doors. Most importantly, the food and drink tasted fantastic--early returns suggest that the brownies and chai are going to be hot sellers. The hours, tentatively, are 6 AM - 10 PM. Perhaps the most inspiring part of the night was watching customer after longtime customer come in to congratulate Fisher, each offering a variation on the same theme. People had moved to the area, gone into his supermarket looking for something, asked about it, and he'd ordered it for them (in my case, it was black pepper). Their stories served as a reminder that while neighborhood change has come, and continues to come, quickly on Franklin Avenue, it need not be an impersonal, unconnected process of turnover. Human interaction, after all, is a necessary feature of the economic transactions that drive such a local change, whether you call the opening of two new coffee shops in one week gentrification or revitalization. On Franklin, residents who've been here 15 years or 15 months (I fall in the latter category), benefit from the presence of community-minded merchants whose ventures have made conscious efforts to serve a diverse and changing population, and to build neighborhood solidarity. Both Tony and his brother said that The Pulp and The Bean is "all about the community," and if it runs any way their supermarket does, it will be. Down the street at the Breukelen Coffee House, Jay (one of the co-owners) sees his place serving a similar function. "I've had people coming in from right over on St. Francis who I'd never seen, coming in for coffee. I've meet probably fifty, sixty, people, and they've met people. There are times when people cross the street because they see someone coming, but now they're both crossing the street to the coffee shop. And then it's like 'You like coffee? I like coffee!' and it starts a conversation." As if to make Jay's point, a patron on her way out broke in to say "Thank you so much for being here." These newest shops join places like Franklin Park (host to the Crown Heights CSA and the Franklin Park Reading Series) and Bristen's Eatery (sponsor of the Franklin Flea) in promoting not just themselves but the Avenue. Their work won't make tensions brought about by rapid change disappear, but it goes a long way towards making Franklin Avenue a nice place to live, and not just rest your head. 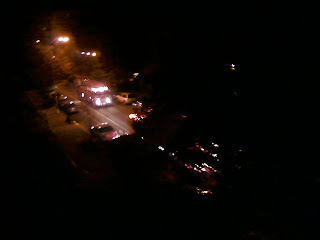 If you heard a big "boom" and felt your house or apartment shake around 11:15 tonight (Thursday), you weren't alone. The whole block felt the blast, which was the result of frayed wires under Dean Street between Franklin and Bedford. Explosions like this are actually fairly common, as one of the FDNY guys on the scene informed me. The mains that hold the wires, which sit just below street level, accumulate water, salt, and other street refuse over the years, and eventually this gunk can short-circuit the powerful currents, causing a building-rattling explosion and blasting manhole covers several stories into the air. The one that blew this evening hit a parked car, but thankfully didn't injure any people. Three fire engines were on the scene within a few minutes to tape off the sidewalks in front of houses that lost power as firemen checked the residences for any potential danger from live current or leaking gases (CO2 is the major potential danger from something like this, as I learned). Plenty of uniformed guys were on hand to calm locals while the fully-geared-up gents checked out the situation. Apparently, this happened a few years back, so most people weren't too freaked out, and things quieted down in a hurry. No danger was found, so the FDNY headed home, with Con Ed promising to come out and fix things up within the hour. 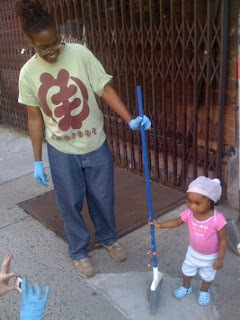 Help Make The Avenue Beautiful This Sunday! 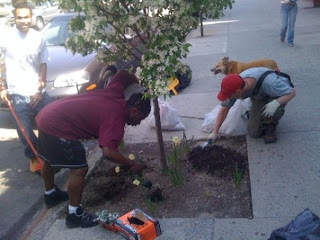 PICK UP A SHOVEL AND MAKE FRANKLIN AVE. GREEN FOR SPRING! 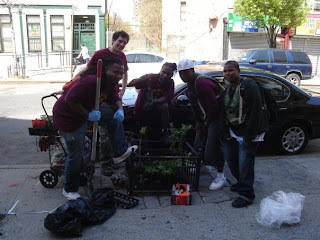 Join your neighbors as we plant daffodil bulbs on Franklin Avenue. In the spring, watch the flowers that we planted bloom! a hand cultivator, trowel, shovel or a just bring something to dig with. "My whole life has been Brooklyn" says Tony Fisher as he moves excitedly around stacks of shelving and brand-new equipment in his almost-finished coffee shop at 805 Franklin Avenue. "Brooklyn's been good to me and my family, and now I'm giving back." Pulp and Bean, as his place is to be called, will be a thoroughly local institution, and Fisher is rightfully proud. "Look at this," he calls from behind the counter, tossing a five-pound bag of coffee beans over to me. "Gillies Coffee, the oldest coffee roaster in the United States, based right here in Brooklyn. It's high quality stuff, and it's all I'm serving." As promised on Twitter (Fisher is a prolific tweeter), everything from the cups to the milk will be made or distributed by Brooklyn-based, family-owned companies, just like Fisher's. The bagels will be delivered fresh daily from La Bagel Delight, and the whole place will draw electricity from the same breezes that ruffle the hair of every Brooklynite, thanks to a green wind-power unit on the roof. Fisher's passion for Brooklyn and its residents extends to his customers, who he promises will be able to get "coffee any way you want it." Standard espresso drinks will be available, along with a wide range of teas (Darjeeling, Rooibus, and China White, all from Gillies, were lying on the counter) and unique daily specials. You'll also be able to pick out whole roasted beans by the pound, and have them grind them for you behind the counter. The "pulp" in the name references the fresh fruit juices and smoothies that will be served, alongside a line of ready-to-eat panini, wraps, and salads. He's got great faith in his staff, all local folks, who he swears will get caffeine-addicted straphangers their fix on the way to the 4 train in three minutes, tops. "That's the kind of service you expect in Manhattan, in Park Slope, and it's what we deserve here, too." Which brings us to Franklin Avenue's recession-be-damned retail boom, which has provided two new cafes (Lily and Fig and the Breukelen Coffee House) to the area already. 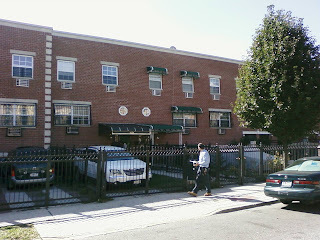 Having done business for 20+ years in Crown Heights, Fisher maintains connections to longtime residents. "I've got mothers who come into my store every day, and now I've just hired their kids. I'm going to train them to be baristas," says Fisher, with a smile that acknowledges how absurd such a proposition might have sounded half a decade ago. Still, when it comes to the changing face of the avenue, Fisher is mostly unsentimental. "Fifteen years ago when we were renovating the supermarket, this place was different," he says. "I had people shot right outside my store. I literally had to hold onto a couple of people until the ambulance arrived . . . Now, any legitimate, local business that comes in, I'm all for it." He's even gone so far as to put friends who do business nearby in touch with realtors as storefronts have come on the market. This last explains Fisher's friendly attitude towards what some might consider competition as he prepares for a soft opening this weekend. "I hope they do well. I hope we all do well. I want this area to keep getting better and better." One of two new coffee shops hitting Franklin Avenue has opened its doors. The Breukelen Coffee Shop kicked things off this weekend to rave reviews and a steady stream of patrons, with the glow of laptops in the window and their menu laid out on a vintage mirror in magic marker. The place looks great, and should have company soon as Franklin Avenue continues its seemingly recession-proof retail boom. Writers SARAH RAINONE and FERENTZ LAFARGUE will spin stories wrapped around iconic songs. Nashville musician KEEGAN DEWITT, in town for the CMJ festival, will give a mini-concert. Rock journalist LAUREN MOONEY will share a sneak peek of her upcoming memoir. Moth GrandSLAM storyteller and comedian SAURABH TAK will make you laugh! There's some fun to be had at either end of this weekend in Crown Heights. 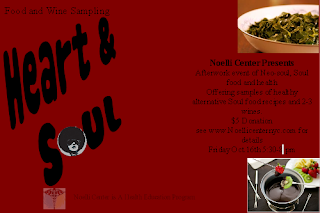 On Friday, the Noelli Center is hosting Heart and Soul, a food and wine event at their HQ on Dean and Utica from 5:30 - 7:30. Swing by to sample some healthy soul food and learn more about their work. On Monday night, the fantastic Franklin Park Reading Series offers up its October installment, "Music and Mayhem," featuring songs as well as readings from local and citywide authors and artists. Nostrand Park's Ferentz Lafargue will be among the presenters, so get out and support your local bloggers! On a more somber note, a pair of shootings hit the area in the past few days, one at Prospect and Classon and one at Franklin and Eastern. The police presence was stepped up significantly after a spate of shootings earlier this summer (though it seems to be at a more "normal" level now), but sadly, gun violence has not completely abated. For those interested in getting involved in efforts to combat these sorts of incidents, the next Community Board meeting is November 12. The nascent Franklin Avenue restaurant scene is about to get a boost from Franklin Park owner Matt Roff, whose ever-growing complex of converted garages and storefronts has become an anchor of neighborhood nightlife. The latest venture? "A day care center," joked Roff when I encountered him outside his gutted storefront this morning, which previously housed a hardware store. The space, which until recently sported one of the best vintage signs in Crown Heights and sits next door to the soon-to-be-opening Breukelen Coffee House, will be a burger joint serving "a couple of great burgers, some vegetarian options, and maybe a sausage or two," says Roff, who hopes to open in a month to six weeks. Best of all, the new place will connect at the back to the 'big room' bar at Franklin Park, providing good food to accompany Franklin Park's good beer. As for the beloved sign, it's being cleaned by a professional for a new lease on life inside the burger place, which may even adopt the name "Dutch Boy Burgers" (they're looking into the legal ramifications of borrowing an old logo and name). 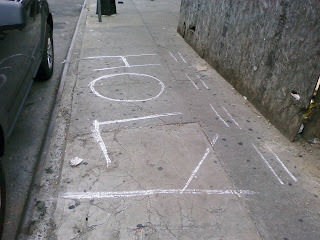 I suppose a modern-day prophet could have consecrated the stretch of sidewalk on Franklin between Eastern and Lincoln, but the word is chalked out right next to a giant hole. This weekend saw the annual Panamanian Day Parade make its trumpet-blaring way down Franklin Avenue, but alas, I was out of town and missed it. The parade, which celebrates the eve of Panama's Independence Day (it separated from Columbia in 1903, with the aid of a battleship sent by Teddy Roosevelt, the first US president to take home a Nobel Peace Prize), is easily Franklin Avenue's loudest and most colorful day of the year. Nostrand Park has some photos up, but they apparently missed the actual event too, leaving new local blog Eye on Crown Heights alone on the scene. The event also marked the rather inauspicious one-year anniversary that I share with my two pre-owned bookshelves pictured above, and offers the chance to re-tell one of my stock "I was a little bit green when I first moved to Crown Heights" stories. 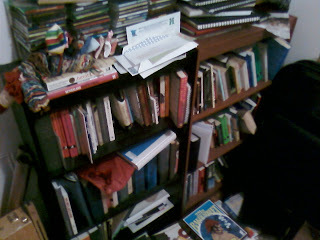 The lady and I had been in our apartment for all of a month when she headed off to work one Saturday morning after observing that my books, CDs, and other effluvia were piled on the floor (or as she put it "you have too much crap."). Inspired by her admonishment, I hopped up, scrolled through Craigslist, and found, to my great delight, a pair of shelves on sale for $10 apiece. I called the lister, who told me that they were all mine but that I had to pick them up by 1pm because she was moving out that very day. And she lived a mile off the D Train. In Bensonhurst. Forty-five minutes later, I made it home, and promptly passed out on the couch. Was it worth it? I got bookshelves for twenty bucks! 1. Pittsburgh Paints - One of East New York's many well-preserved hand-painted signs. 2. Twisted Metal - All that remains of the Pitkin Avenue portion of the original Fulton Avenue El. 3. Royal Wallpaper and a lovely old building that may have been a bank - Pitkin Avenue was a main-drag shopping area for much of it's history, and a few remnants of that era remain. 4. The Loew's Pitkin Theater - A crown jewel of the Loew's chain, this spectactular greek-revival theater is now totally decrepit (there's a tree growing out of the porous roof), but hopefully not beyond repair. It's been up for awhile, but the upcoming MJ movie reminded me that this poster in the window of a first-floor apartment on Franklin is my favorite tribute. The Jackson 5?! 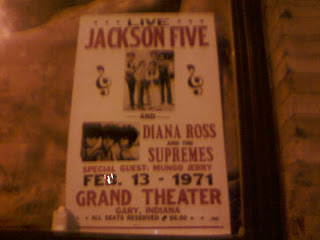 AND Diana Ross and the Supremes (and seriously, Ms. Ross on the undercard? You KNOW that means the Jackson 5 were unreal)?! Mungo Jerry were probably pretty amusing, too. Sadly, this poster is out of stock in the great wide world of online purchasing, but you can get another one from a date at the same venue a month later. As for the Grand Theater, the only information I could find about it was here, which tells you that it sat 600 and was demolished. In totally unrelated news, check out this fascinating story about that most quintessential Brooklynite activity, immigration to Brooklyn. I just got the latest on the October Reading Series at Franklin Park--looks to be a good one! As the theme is "Music and Mayhem," there'll be some tunes this time, too. 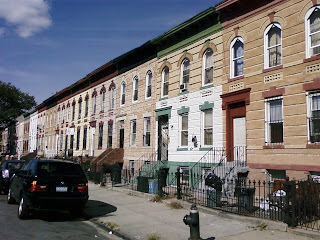 A special shout-out to local blogger/community activist/photographer/all-around awesome guy (based on one brief chat and everything I've heard about him) Ferentz Lafargue, who founded and edit's Crown Height's premier online destination, Nostrand Park. Also, if you're interested in staffing the bookselling table at this event, use the facebook link below to get in touch with Penina Roth, the series organizer, who is looking for some steady help in that department. Franklin Park Reading Series -- "Music and Mayhem Night"
SARAH RAINONE, author of the debut novel Love Will Tear Us Apart, is a freelance writer and editor living in Brooklyn, NY. She has worked for Doubleday and Harper Collins, interned at the Providence Phoenix and is a member of the Authors' Guild. A graduate of Syracuse University’s Magazine Journalism and English programs, she grew up in Cranston, Rhode Island. As a bass player and improv student, she has performed at The Blue Note and the Upright Citizens Brigade Theatre. FERENTZ LAFARGUE, the author of the memoir Songs in the Key of My Life, is an assistant professor of Literary Studies at The New School’s Eugene Lang College. Born in Haiti and raised in New York City, he is the founder and editor-in-chief of NostrandPark.com, the “virtual town square” of Crown Heights, where he currently resides. His essays on politics, entertainment, community outreach and the Haitian diaspora have appeared in 215mag.com, Bronx Biannual, the collections Starting With I (Persea Books, 1997) and Strong Teens, Strong Neighborhoods (2007) and The Huffington Post. His forthcoming project, Country City Country, is a blend of memoir and social analysis exploring relationships between Haiti and the United States. SAURABH TAK (or just “Tak”), a Moth StorySLAM winner, has been featured as a storyteller at Columbia University in New York, for Speakeasy DC in Washington DC and for Un-cabaret in Los Angeles. Most recently, he won rave reviews at DC’s Capital Fringe Festival for his tale of Lust in the Speakeasy Stories showcase, “The Sin Show “ (seven sins, seven stories!). A Crown Heights resident, Tak has also published opinion pieces in The Washington Post and on the blog, The Moderate Voice. KEEGAN DEWITT is a singer-songwriter and composer with a unique talent for translating the human experience into art. His score work began with the SXSW selected "Dance Party USA" and the Independent Spirit Award-nominated, New York Times Critic's Pick "Quiet City." Since then, he has scored over 10 different films in the span of three years and released two albums and an EP of his string-laden chamber pop. He attended the film conservatory at SUNY Purchase and is a graduate of the Atlantic Theater Company. A native of Portland, Oregon, Keegan now divides his time between Nashville and Brooklyn. It was just chilly and breezy enough to be spooky on my roof this evening, and I tried to capture it with a few long exposures. They don't really do the crisp fall weather justice, but I enjoyed the colors that found their way into the photos. Phoebe Neidl wrote a great profile of Brooklyn historian Wilhelmena Rhodes Kelly for the Brooklyn Daily Eagle that ran today, complete with some great pieces of local lore. Who knew the Redcoats camped Hessian mercenaries at Franklin and Bergen during the Revolution? Kelly's latest book, on Crown Heights and Weeksville, is out now. 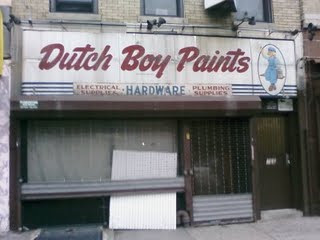 Also, the Dutch Boy Paints sign on Franklin at St. John's has come down. 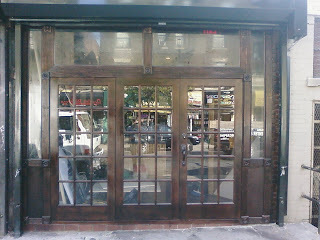 I thoroughly enjoyed this vintage piece of the storefront, so I hope that whatever comes in is worth the loss.